Celebrity-branded marijuana strains are commanding a premium in recreational markets by capitalizing on name recognition and sophisticated branding. The average markup of a celebrity-branded strain versus its unbranded counterpart is approximately 24%, which often equates to $5-$10 more per eighth, according to an analysis by Marijuana Business Daily. 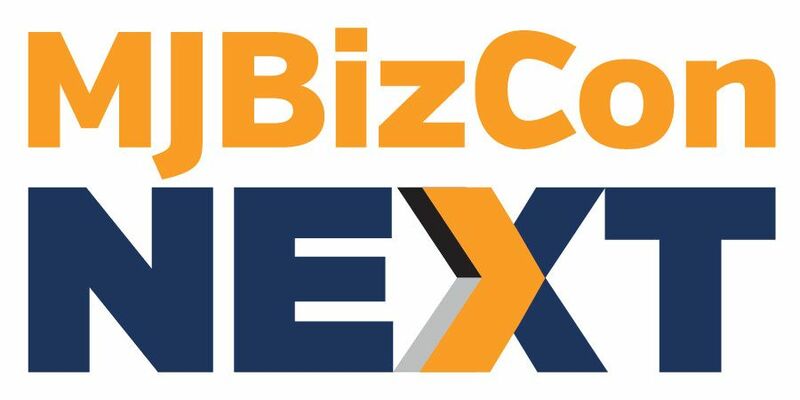 The findings highlight the long-term potential of such offerings and the power of using a well-known name to sell cannabis to recreational users, who often consider different factors than medical patients when purchasing marijuana and are also less familiar with the plant in general. A rec consumer who walks into a retail marijuana store can quickly become overwhelmed by the number of products and strains available for purchase. Offering a branded strain gives consumers a sense of familiarity, allowing them to quickly cut through the confusion. Some of these consumers might believe a strain bearing the name of, say, musician Willie Nelson is of a higher quality than one called Golden Goat or Green Crack, regardless of whether that’s the case. They are then willing to pay more for that product, which traditional businesses have found for decades via endorsement deals with athletes, movie stars and other prominent people. For this analysis, Marijuana Business Daily used the dispensary/rec store listing site Leafly as a tool to compare menu items and pricing, drilling into price disparities between eighths of celebrity-branded marijuana and the traditional strain in recreational cannabis stores where both are available for purchase. For example, the price of an eighth of Chong’s Blue Dream – named after comedian and noted marijuana user Tommy Chong – was compared only to that of another eighth of standard Blue Dream offered by the same store. Currently, Tommy Chong (Chong’s Choice), Snoop Dogg (Leafs by Snoop) and Willie Nelson (Willie’s Reserve) have branded strains of marijuana available for purchase in Colorado, Oregon and Washington State. While these three brands are not the only celebrity-backed marijuana products on the market, each offers a branded version of traditional flower that allows for direct, one-to-one pricing comparisons – providing a clearer sense of the price premium stemming from a celebrity endorsement. While the average markup is nearly 24%, it can vary widely between states and brands. In Colorado, the price of a Chong’s Choice strain was on par with the same, unbranded strain of marijuana. Strains of Willie’s Reserve, however, averaged a 50% markup over their unbranded counterparts. Variation in price markups between these brands can, in part, be explained by how each is positioning itself in the market. Purchase an eighth of Chong’s Choice at a recreational shop and the flower will be taken from a jar, measured and put in the same type of packaging that the store would use for any other strain of flower. On the other end of the spectrum, Willie’s Reserve and Leafs by Snoop strains are sold pre-packaged. Both sport heavily branded and stylized packaging reminiscent of high end consumer electronics. The unique dynamic of each state’s market also factors into the markup on celebrity-branded products. 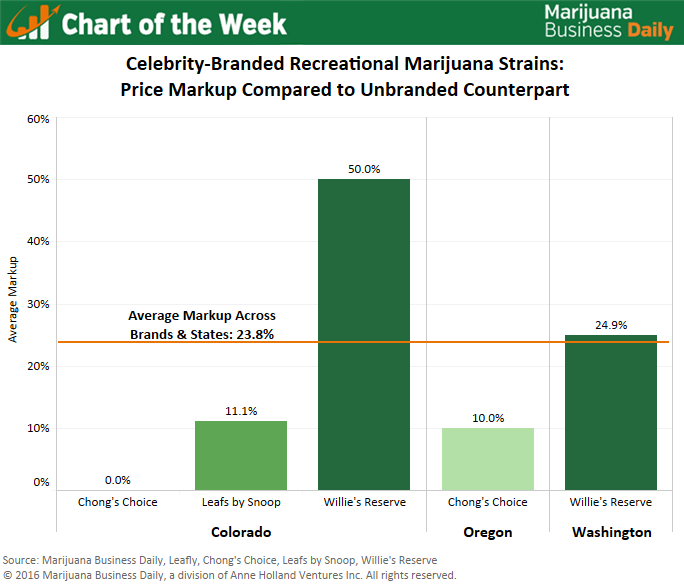 In Washington, the average markup on Willie’s Reserve strains is considerably less than in Colorado, primarily stemming from differences in how stores in each state approach product assortment. Whereas many dispensaries in Colorado offer one strain of Blue Dream, for example, stores in Washington may carry as many as four – each provided by a different cultivator and offered at a range of price points. Willie’s Reserve often occupies the highest tier of pricing in Colorado, while in Washington that’s not always the case. The data on comparisons is limited, due primarily to the relatively low market penetration celebrity-branded products have achieved thus far. Therefore, this analysis is intended to provide a snapshot of this particular market dynamic rather than a comprehensive examination. Based on the price differential, it seems the trend toward celebrity-branded cannabis is paying off and could become a much bigger part of the rec market in the future. Good article. However, one correction. Dispensaries do offer more than one Blue Dream strain. Check out Oasis Cannabis Superstores. They have 200 strains or more. Often times you can choose between 3-4 batches of Blue Dream. Also, this store, carries many growers. It is not just their own stuff. A sample size of 5 is not enough to gauge whether the markup is higher. What appears a significant 24% increase could be within margin of error. Also what could be the reason for willies reserve being so much higher than the others?